The Enbridge Northern Gateway Pipelines is a project to build a twin pipeline from Bruderheim, Alberta to Kitimat, British Columbia. The eastbound pipeline would import natural gas condensate and the westbound pipeline would export diluted bitumen from the Athabasca oil sands to the marine terminal in Kitimat for transportation to the Asian markets by oil tankers. As with many such projects that have an impact upon First Nations communities and lands it is controversial. Many Aboriginal groups oppose the Northern Gateway pipeline proposal, though some others have signed agreements supporting it. Enbridge and some Aboriginal groups disagree on the extent of this support and opposition. The Wet'suwet'en First Nation has adamantly opposed the pipeline, as well as many Dakelh First Nations including the Saik'uz First Nation. West Coast Environmental Law has compiled a list of over 130 First Nations opposed to the Northern Gateway Pipeline. For the part of the BC government the project is presented as a vital part of the ongoing energy needs of the province - providing both energy and jobs for the community. As part of the approval process an evaluation of the project was made jointly by the National Energy Board and the Canadian Environmental Assessment Agency. The project was approved subject to 209 conditions and the Federal government announced in June 2014 that the project would go ahead. There are a number of questions that arise in relation to this case study. Firstly we consider whether Canadian legal protection of First Nations Rights in any way equates with Indigenous laws. Secondly, we consider whether the rights of the First Nations communities that are acknowledged in Canadian law and the Charter are sufficiently protected. Finally, we consider if it is possible to reconcile the economic interests of the company and governments with the rights of the affected First Nations communities? Put simply, is it possible to reconcile the competing interests between the project proponent and those First Nations communities who oppose the project on the one hand and the conflict between First Nations - where some communities oppose the project and others are in support of it. The experience of Indigenous and First Nations peoples globally in the colonial moment has been one of violence, dispossession and genocide. The scramble for mineral resources and new land was justified through the use of the doctrines of discovery and terra nullius. Underpinning both of these strategies was the belief that the Indigenous peoples were insufficiently advanced to be possessors of title to land. In short they were considered to be barbarians or savages - who could lay not valid claim to their traditional and ancestral lands. This was as true of Canada as it was of the colonial moment in Africa, Asia, the Americas and the Antipodes. While there is clearly a dispute between the various parties (the stakeholders as some contracts would term them) we also need to consider how the rights of First Nations communities continue to be dismissed or diluted. As a guide to understanding how the First Nation (Indigenous) "Other" is represented in the media reportage and the strategies of resource extraction companies we will draw from a range of theoretical writers such as, among others, Edward Said, whose work Orientalism offers a way of thinking about how First Nations interests and rights are represented in non-Indigenous society. The Enbridge Northern Gateway Pipeline represents an important part of the economic plan for the Federal government and also the provincial governments of BC and Alberta. It is also a good example of how First Nations interests and rights can be subsumed or dismissed where the resource proponent exercises sufficient influence. An added dimension to this is the fact that much of British Columbia is unceded territory - meaning there are is not an historical treaty that delineates the rights and interests of First Nations communities - and there is also a significant body of Supreme Court decisions that recognize and protect the rights of First Nations. Prior to the announcement by the Federal government in June 2014 that the project would proceed there was an environmental assessment conducted by the National Energy Board and the Canadian Environmental Assessment Agency. Despite the fact that 1,159 of the 1,179 submissions received by the National Energy Board argued against approval (including all expert submissions) the National Energy Board approved the project. While the BC government endorsed the streamlined approach that the Federal government developed for the approval process it also opposed the National Energy Board decision because the approval failed to match the standards of the province's own environmental provisions. The Enbridge Northern Gateway pipeline case is similar to the experience of so many other resource extraction disputes - the importance of the economic value to the Province or the nation in conflict with the rights of the First Nations communities over whose land the pipeline will travel. According to the company the pipeline project will stretch for 1178 kilometres and carry up to 525 000 barrels of oil per day from northern Alberta to the deep water port of Kitimat. What are the benefits of the project that the company identifies for (a) the Canadian economy (b) employment opportunities (c) the provinces of British Columbia and Alberta (d) First Nation and Metis communities? What often emerges in disputes such as this case study is the belief among the wider (non-Indigenous community) that the articulation of First Nations rights in some way represents "special treatment" or a form of reverse-discrimination. So the social impact can potentially be a rift between the First Nations communities and residents of local towns who see the project as the way of obtaining employment. Conversely there is a body of non-Indigenous organisations and individuals who support First Nations in their opposition to the pipeline - for example, the West Coast Environmental Group. One of the most polarizing aspects of the project is the potential for environmental damage - which is one of the main reasons for opposition by lobby groups and activists. When the National Energy Board approved the project in June 2014 a number of environmental and community groups mobilized against the project including BC Nature; ForestEthics Advocacy Association; Living Oceans Society; Raincoast Conservation Foundation; and Unifor. What are the main environmental concerns about the Northern Gateway pipeline that have been raised by community and environmental groups? There is a significant difference in the estimation of the likelihood of an oil spill between the company's data and independent research from SFU. How do you think we can explain this difference? When the Enbridge Pipeline project was first announced the company initially claimed that it had signed agreements with 60% of the First Nation communities on the proposed route - a statistic that was strongly challenged by the Coastal First Nations Alliance. As the project proceeded a number of strong alliances emerged in opposition to it - notably the Yinka Dene alliance, which comprises the the Nadleh Whut’en, Nak'azdli, Takla Lake, Saik’uz, Wet’suwet’en and the Tl'azt'en First Nations. According to the West Coast Environmental Law Group at least 130 First Nations Bands have indicated that they are opposed to the project. A number of First Nation coalitions have emerged in response to the project. A significant result that emerged from this was the Save the Fraser Declaration which was endorsed by more than one hundred First Nation Bands at meetings held at T'exelc (Williams Lake) and Vancouver. There have also been (as noted above) at least three legal cases brought by First Nations bands to challenge aspects of the project. In January 2016 the BC Supreme Court ruled in the case of Coastal First Nations v British Columbia (Environment) 2016 BCSC 34 that the Provincial government had failed in its duty to consult with the Gitga'at and other coastal First Nations. Drawing from the Atkinson reading below what are the main reasons that many First Nations bands have opposed the Northern Gateway Pipeline? Apart from environmental considerations there were also submissions made on the impact of the project on the cultural life of the communities. Look at the Gitga'at environmental impact report (pp.4-9). What are the impacts upon the cultural life of the Gitga'at that are identified? The successful Gitga'at BC Supreme Court case of the Coastal First Nations v British Columbia found that the BC government had "breached the honour of the Crown by failing to consult" with the First Nations. Look at pp.61-68 of the judgment. What does a "duty to consult" mean? In what way did the Court find the BC government failed in its duty? 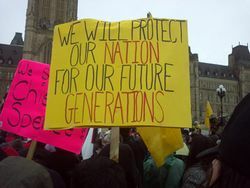 The Save the Fraser Declaration makes explicit reference to the "ancestral laws, title, rights and responsibilities". The article by John Borrows, a First Nations law professor, discusses the links between Aboriginal law and Canadian Law - he concludes that the the validity and flexibility of First Nations law is such that it can be articulated to make it recognizable by both non-Aboriginals and courts of law. Do you find his argument persuasive? How amenable do you think non-Aboriginal Canadians are to the recognition of Aboriginal law as a system of law and what arguments might be made both for and against such recognition? Borrows, John. "With or without you: First Nations law (in Canada)." McGill LJ 41 (1995): 629. How would a legal scholar, approach responding to the problem outlined in this case study, and what are some responses they might offer? From a legal perspective it would be a case of finding the actual project description and what steps the Provincial governments of BC and Alberta have taken to authorize the project. It is important to be clear on the route of the pipeline. Then we should consider what legal requirements follow from the project - what First Nations legal rights are relevant (treaty, case law or legislation) and also the relevant environmental assessment requirements. It is also important to consider whether the Canadian legal framing of First Nations rights corresponds with how the First Nations themselves understand their rights under traditional law. The most significant aspect of the case would be the rights of the First Nation groups opposed to the pipeline and whether these rights can be enforced. Can these rights be over-ridden by legislative enactment? What rights do each of the First Nations groups have in relation to their territory and whether these rights can be suspended or erased by legislative action on the part of the provincial governments of BC and Alberta. What provisions exist under the environmental legislation for both Provinces which the project proponent must comply with. How might a mediation between conflicting parties take place? What does this conflict tell us about the relevance of Canadian law for First Nations communities and First Nations law? Can the existing provisions under Canadian law adequately reflect or protect First Nations culture and land? In a negotiated or mediated agreement is it possible for there to be a genuinely equitable and fair outcome? It is important to be clear on all the relevant case law precedents and legislative provisions that might be argued in relation to the proposal. So in the first instance it would be about defining how Canadian law recognizes the rights of First Nations communities. In addition there would be a requirement to consider the academic literature on the issues that arise from a project such as this. Reference to other analogous disputes and projects from both Canada and other nations would also be part of the literature review. How might an instructor in law, (Institute of Gender, Race, Sexuality and Social Justice) incorporate this case study into their course readings, discussions, and assignments? The case study could be approached as the basis for a group discussion. Having mapped out the various positions of the main parties comprising several First Nations groups, the government and the industry proponent (and perhaps a representative of local non-Indigenous community) the class could discuss the ways in which the dispute might be discussed. This might necessitate discussing the terms of any agreement that has been put to the First Nations groups and the provisions of the pipeline agreement in relation to cultural heritage protection and community benefits. The readings for the course allow for a consideration of the broader issues of coloniality and protest (for example the Idle No More movement) and the work of academics such as Glen Coulthard (Red Skin, White Masks). This in turn opens up the discussion as to the usefulness and place of Canadian law in attempting to define and protect First Nations cultural rights and lands. In addition to questions relating to the project and its relationship to the Law of both Canada and First Nations, students could also consider what the conflict tells us about the nature of relations between First Nations and non-First Nations Canadians. How has the First Nations position in the dispute been (mis)represented? What does this tell us about the media representations of, and community attitudes towards, First Nations peoples. How would an Economist approach responding to the problem? I do not have sufficient knowledge about the Enbridge case to comment on the legal rights and wrongs, but I am surprised at the implied assertion that only the “colonists” care about the economic benefits of resource development. As an economist a key question that I would ask how the economic benefits can be shared equitably, recognizing the importance of non-market benefits, as represented by culture. You do, by the way, indicate that the FN position is not uniform. With my work in fisheries, I know of one instance of extending economic benefits to indigenous people, namely New Zealand, where the Maori were granted economically important rights under the New Zealand quota scheme, to the extent that a major fishing company is under Maori control. I have, by the way, been to NZ and have met with Maoris in the fishing industry. (Gordon Price). How might an instructor in Economics incorporate this case study into their course readings, discussions, and assignments? How would a social scientist, approach responding to the problem outlined in this case study, and what are some responses they might offer? A social scientist might focus on the treatment of tenure and overlapping claims to the lands through which the proposed pipeline will pass. Students might also consider the multi-stakeholder processes: who gets to participate and in which forums? And the issues of risk: short-term and long-term. Who bears the burden? How are benefits apportioned and shared? I would explore the issues of hereditary ownership versus access rights of the lands through which the pipeline passes. My understanding is that outsiders (Federal and Provincial Government, industry) have not always paid attention to the distinctions between recognized 'owners' versus 'persons with access rights' to demarcated areas of Lands, Territories and Resources (LTR). Ownership rights were formalized in potlatches and formed part of Indigenous governance processes. So I would ask students to dig deeper into the cases of which FNs voted in favour and which not. What of overlapping rights? Were FN traditional governance systems respected? Or did outside constituency groups muddy the waters and select whose voices were given a hearing? Students might consider the claims to job creation made by pipeline proponents: How many short vs long-term jobs would be created? How many skilled versus unskilled jobs would be advertised in each phase? Another angle would be to interrogate the levels of risk: What are the risks to BC's tourism industry from pipeline-associated accidents? What are the risks to BC's fishing industry from potential pipeline-associated accidents? How might an instructor in social sciences incorporate this case study into their course readings, discussions, and assignments? Post Thumbnail: Protesters in Ottawa by Moxy, CC BY-SA 3.0.